Both of our boys recently had dentist appointments. They did really well and walked out with clean teeth and the all-clear for cavities (none yet). They chose a prize and were given a bag of goodies including a new toothbrush, some toothpaste, and a couple stickers. Now, I’m not about to start any boycotts, but I can tell you the failure sticker went right in the trash. Because in this house, not only is failure an option, it’s a requirement. I wouldn’t wish failure on anyone in my life, but to pretend it’s possible to avoid in every situation is not realistic. The mentality behind “failure is not an option,” is not only damaging to young minds, but also to parents who may set expectations too high, be it for themselves or their children. I always have to gut-check myself when the boys are learning something new. Yes, I want them to succeed, but it’s just as important (and in many ways more important) that they learn something from failing as well. I’ve seen the most growth in my life as a result of my failures, both big and small. Failing is not fun, but growth is life. Well, I am rephrasing that quote so I can teach my boys how to fail with style. If they can master that at a young age, there will be no stopping them. Before you can fail, you must take a leap of faith. You have to sign up for the class or try out for the team or join the club. You have to know what you want and go after it. Taking the leap is the hardest part. Don’t miss out on life because of fear. Growing up, I was never allowed to quit an activity mid-season. I could choose not to sign up for another year, but I had to follow through. This is important when it comes to accepting failure and moving on with a clear conscience. Life can be hard, but that doesn’t always mean you are failing. Keeping your commitments will help you know the difference. Even if you learn you are not cut out for a particular activity if you finish you are already winning. Ok so you took the leap, kept your commitments and it still didn’t work. You just weren’t made to play guitar or skilled as an artist or a brilliant poet. Once you can accept that you may not be the world’s next whatever, you can move on to try something new. That doesn’t mean you never play the guitar again. It just means you are being realistic about how far that particular skill will take you in life. I’ve made a lot of mistakes; too many to count. But if I am good at something, it’s squeezing my mistakes for any positive drop of information I can take with me. Learning to accept correction is probably one of the most important lessons we can learn as children, adults, employees….You get the idea. No one on earth will excel at everything, but that doesn’t mean we can’t learn a few things along the way. We all have our low moments. Figure out how they can help you and rise above. Forgiveness makes the world go ’round if you ask me. When we learn to forgive ourselves for stupid mistakes, we can forgive others who do stupid things. I get so mad when I spill things. I mean I get visibly shaken and I just don’t understand how I dropped the cup or splashed the sauce when stirring. Sometimes I let out an audible sigh of exasperation. Recently, my son Calvin (age 3) came up to me and said, “That’s ok mama. Accidents happen.” And he was totally right. He extended forgiveness to me for my mistake and I really needed it. It’s time to bring the expectations back down to normal levels so we can be free to try new things, succeed at some and fail at others and remind ourselves that life is a journey to experience, not a race to be won. Failure teaches empathy, understanding, value, and resilience. I’d be a fool to keep that opportunity from the people I love. 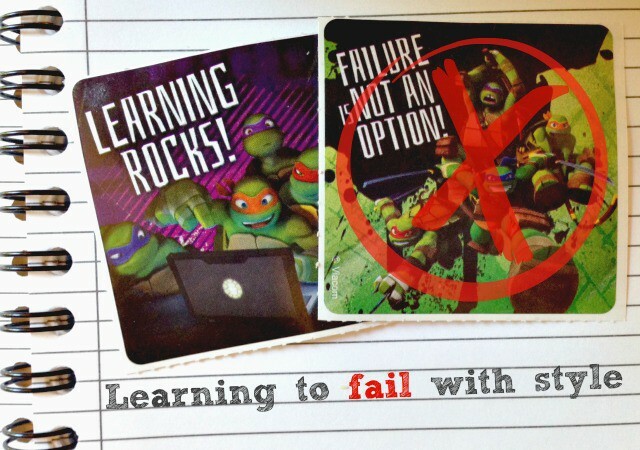 So while I appreciate the free stickers, I’m going to keep failure on the table and focus on the fact that yes, learning rocks. How do you approach failure? Do you have any tips to add on failing with style? This might be one of my most favorite posts you’ve ever written. I’m with Erin!! This is fantastic girl!! I love this so much. I’m still learning that failure is okay-I think I was hard-wired to think otherwise- and take as much as I can from my mistakes.